When it comes to blowers, the biggest concern is power — power to move all the leaves and debris you want to move. Sometimes, there’s confusion about how to measure that power. Most blowers brag about the speed of the wind they produce, but the VOLUME of air they move is really a better indicator of power, and that’s measured in CFMs, or cubic feet per minute. 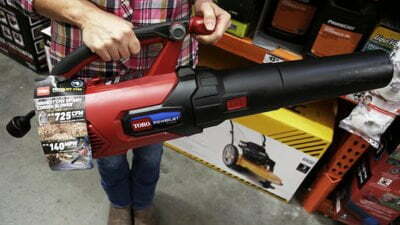 The Toro PowerJet F700 Electric Leaf Blower has the highest CFM rating of any corded blower. It moves 725 cubic feet of air per minute at up to 140 mph. Air at that speed and volume can help you tackle the toughest clean-up jobs like moving heavy, wet leaves. This blower is also lightweight at only 6.6 pounds and its variable-speed dial allows you to match the power to the job. Use low speed around landscaping and hard surfaces and high speed for tough lawn chores or getting debris out of crevices.